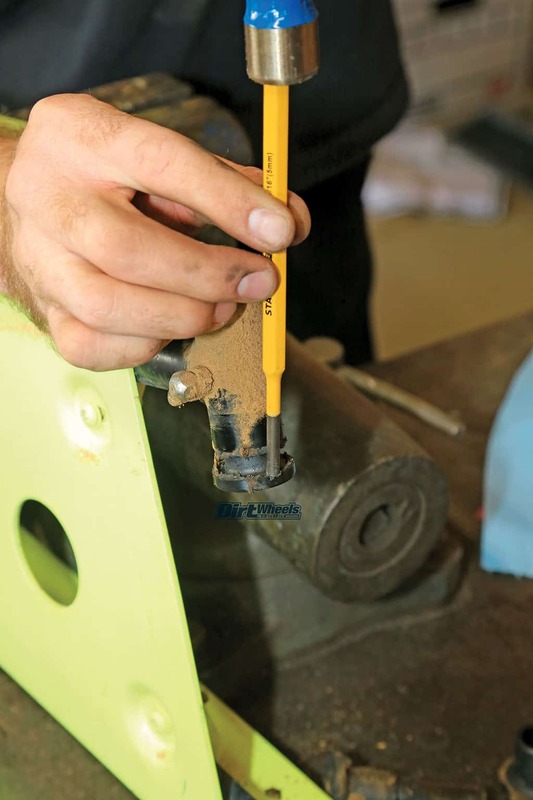 Hard driving puts wear on your suspension and that could mean it’s time to change your bushings. 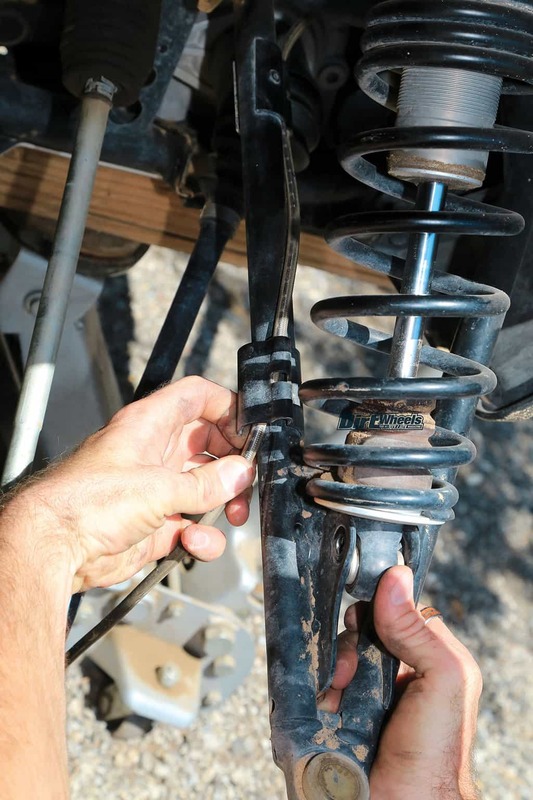 Keeping the suspension working well on a quad or UTV requires a variety of parts to function as they should. Adjusting the spring preload and fine-tuning the adjusters are the fun part. There are less glamorous duties, like making sure that the suspension arms are operating as they should. 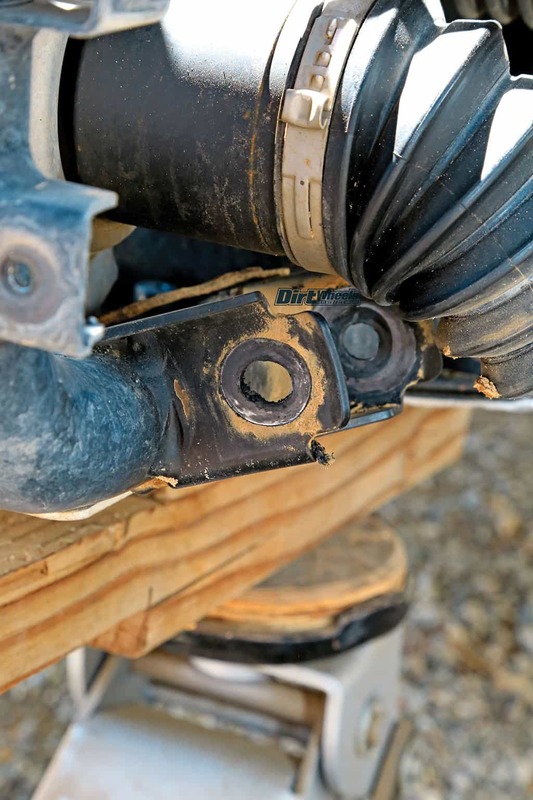 Most quad and UTV suspension arms pivot on simple plastic bushings with a sleeve for the bolt to go through. For the most part, these work well for the job, but they can wear and get loose. 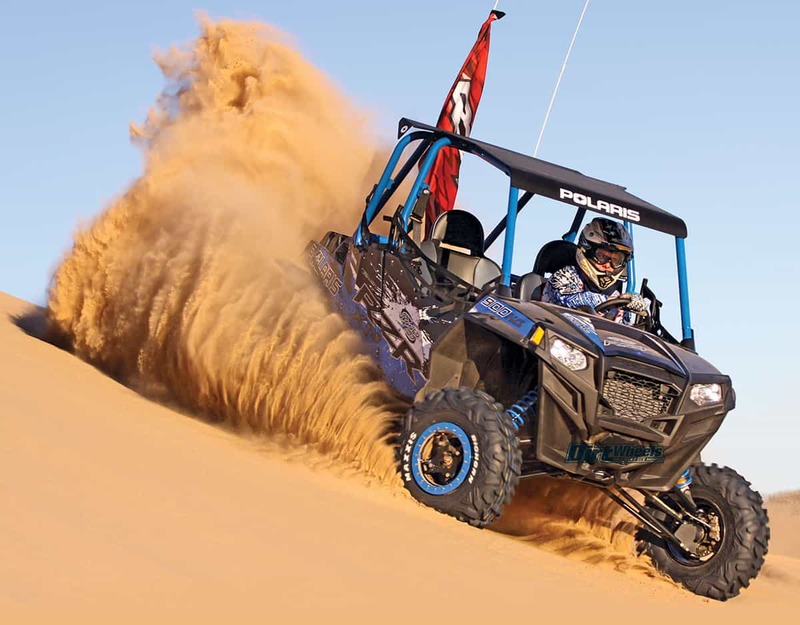 We chose a clean-looking Polaris RZR 900 as an example, because the A-arms had a frightening amount of movement in them. It turned out that the bushings were indeed worn, but we also found loose suspension bolts that should have been checked far more often. We also discovered the grease on the bushings was dirty, and since the 900 has grease Zerks, there is no reason for that. 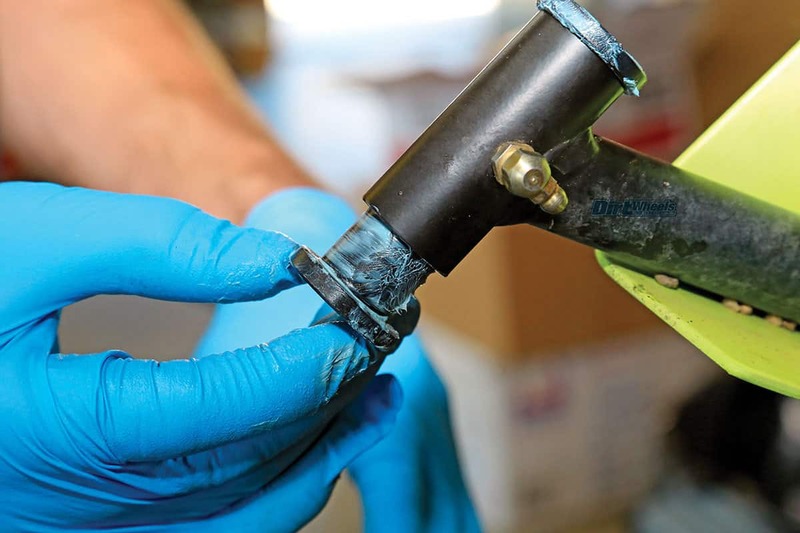 Frequent greasing would have kept the grease clean and extended the life of the suspension parts. We made two mistakes that held up the job. We should have known that any machine with worn bushings would also have worn ball joints. 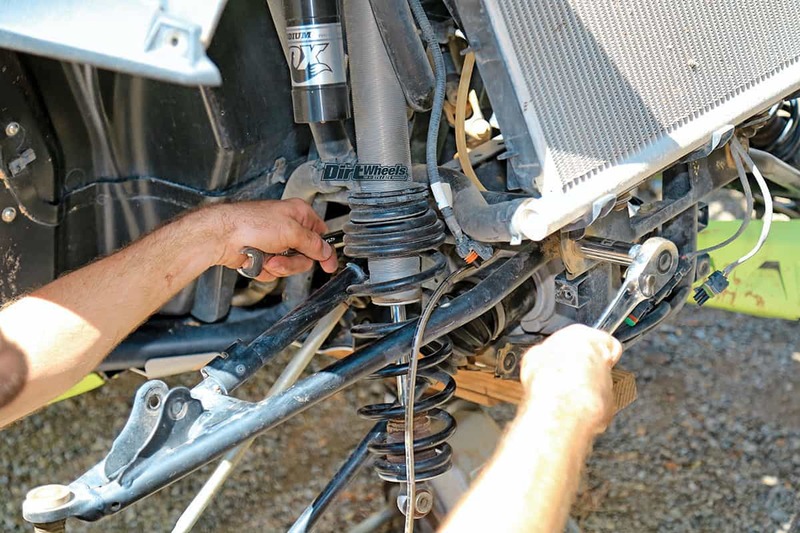 Also, Polaris recommends that all suspension bolts be changed along with the bushings. After seeing the condition of the original bolts, we can see why. Ordering those parts up front would have made our task a one-day job. As always, make sure that the machine is jacked up and properly supported so that you can work safely. In addition to the normal hand tools, you will need some shop towels, contact cleaner and some quality waterproof grease to finish the job. 1. Loosen the lug nuts for the wheels you will be working on, jack the machine up and properly support it. Then, remove the wheel. The 900 has a long top A-arm bolt, so we had to remove the aftermarket bumper, disconnect the lights and remove the fascia to get the bolt completely out. 2. 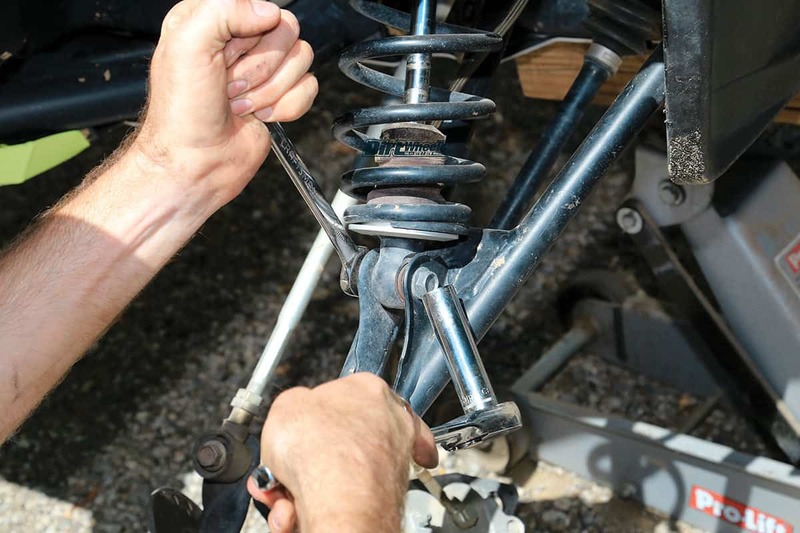 Remove the lower shock bolt and, if necessary, zip-tie the shock up out of the way. If you do one arm at a time, the other arm should able to support the hub and brake. Start with the upper arm. The shock mounting bolt showed wear and corrosion, so it should be replaced for safety. 3. You will need to remove the brake line from the clamp that secures it. It simply slid out on the RZR 900, but other models may have rivets that you need to drill out to remove the plastic clamp from the A-arm. In that case, you will need to rivet the clamp back on after reassembly. 4. 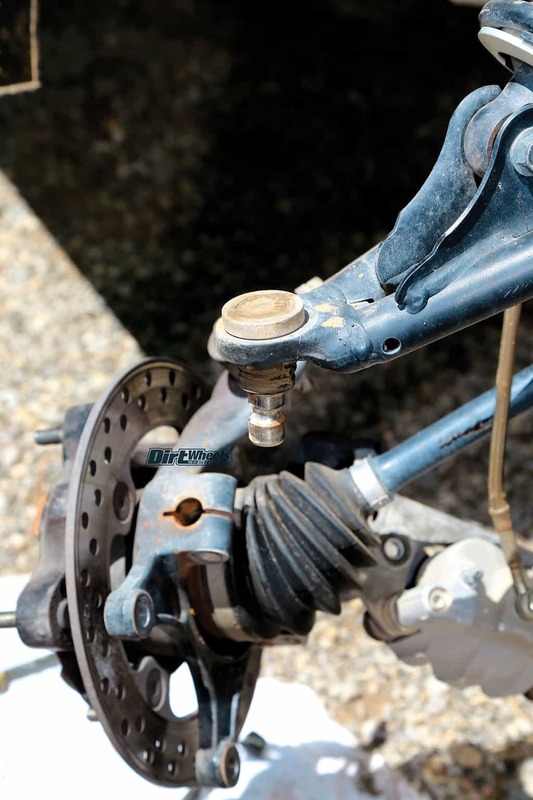 Remove the pinch bolt for the upper ball joint. 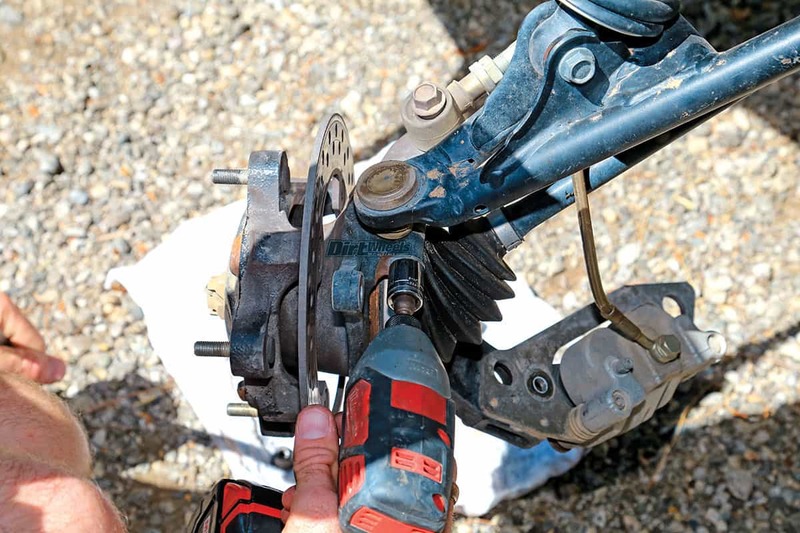 If you hold the upper A-arm with one hand and tap the hub with a soft-faced hammer, the ball joint should separate from the hub assembly. It shouldn’t take a lot of force to break it loose. 5. Finally, you can loosen the mounting bolts, pull them out and remove the A-arm from the machine. Inspect the arm to make sure that it is in good shape and is undamaged. We had just a small bend in the A-arm that didn’t seem to be more than a dent, but it radically affected steering in one direction. 6. We lightly clamped the A-arm in a vise with soft jaws to hold it while we worked. It took mild taps to get the old bushings to slip out. There is a center sleeve and two bushings that need to be removed. 7. Use cloth or paper shop towels and contact cleaner to clean the parts up well. You can see that the arm has the paint worn off a little, but it isn’t mushroomed or excessively worn. The new parts should fit just fine. 8. 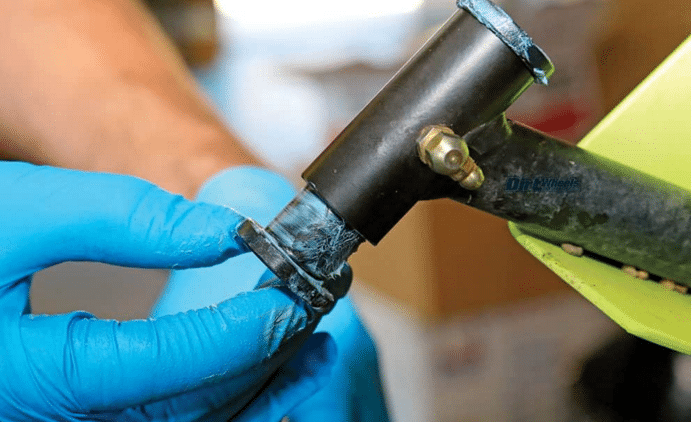 Grease the inside and outside of the new bushings before you push them in. 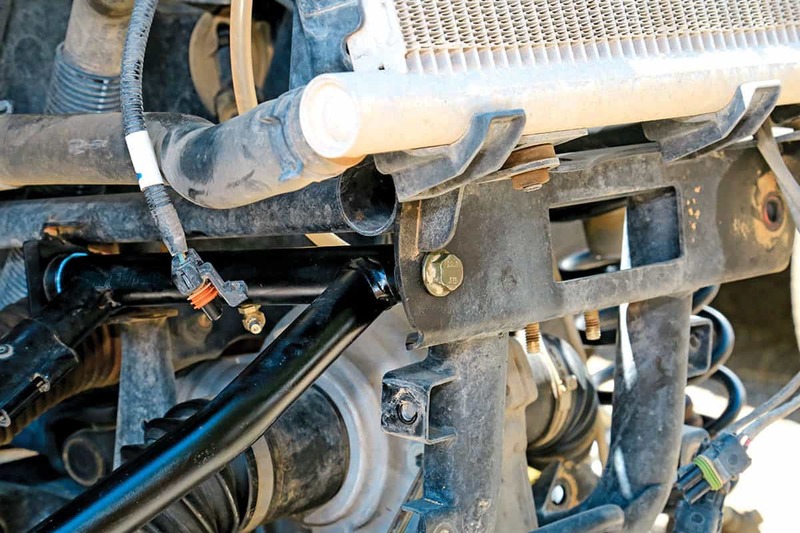 The RZR 900 has grease fittings to lube the pivot points. If you have no grease fittings, we would use more grease than this. Use a quality waterproof grease. 9. 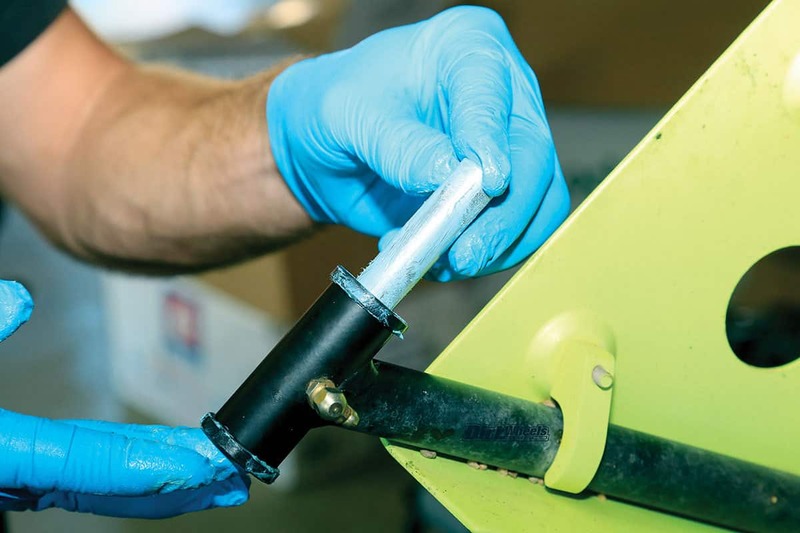 After the bushings are greased and pressed in (we did it with our hands with no problem), grease the inner sleeve and slide it in. There is a space in between the bushings that acts as a grease well. It we didn’t have grease fittings, we would have packed that area with grease. 10. 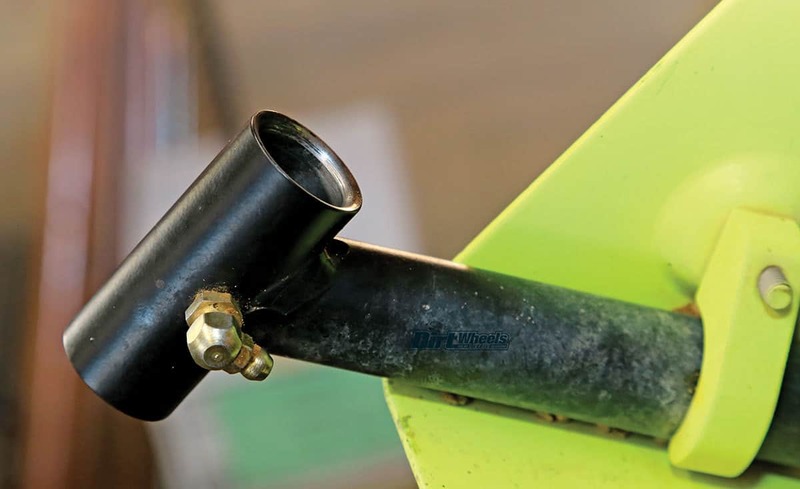 This is the upper passenger-side A-arm mounting bolt from the RZR 900. There is plenty of corrosion, and if you look next to the bolt head and where the threads start, you will see wear on the steel. Replacing a bolt like this is cheap insurance. Safety first. 11. 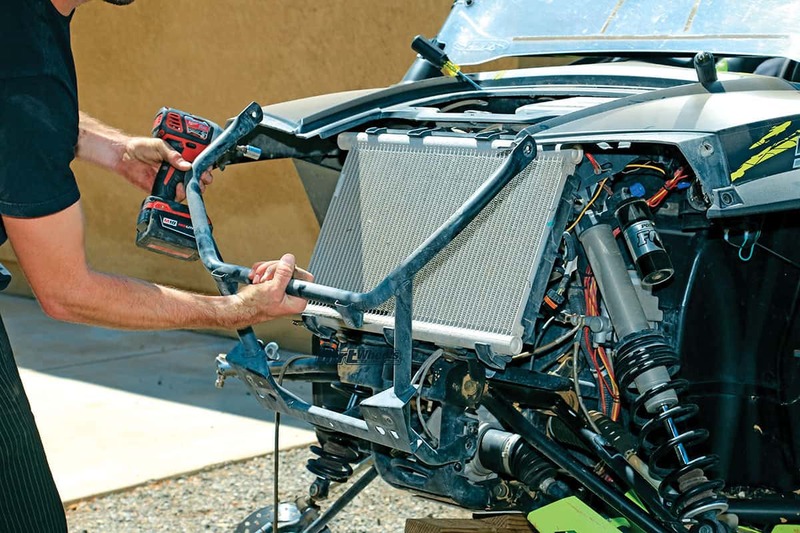 This is the driver’s side of the RZR 900 where the owner lets the suspension bolts get loose. As you can see, the holes are worn a bit egg-shaped now. This is difficult to fix without going to a fabricator. This is a shame, as it could have been avoided by routine safety checks of the suspension. 12. It is finally time to mount the freshly rebuilt and greased A-arm with the new bolt. Everything should be a little tighter and more solid with the new parts installed. There should be no play in the arm after it is tightened. 13. Now it is time to attach the ball joint and insert and tighten the pinch bolt. The pinch bolt is another fastener that should be replaced. We will be replacing the ball joints as soon as they arrive. We should have planned on replacing all the parts at once. 14. While you are doing the assembly, just snug the bolts up. When you are finished, go around and torque all of the fasteners to the correct torque values. The torque values change from machine to machine, so you will need to look them up. Repeat the same process with the lower A-arm, and move to the opposite side of the car. Honestly, the job is a little tedious and somewhat dirty, but taking the bumper and fascia off with was the most time-consuming part. Pulling the arms isn’t too difficult, and changing out the bushings was easy. 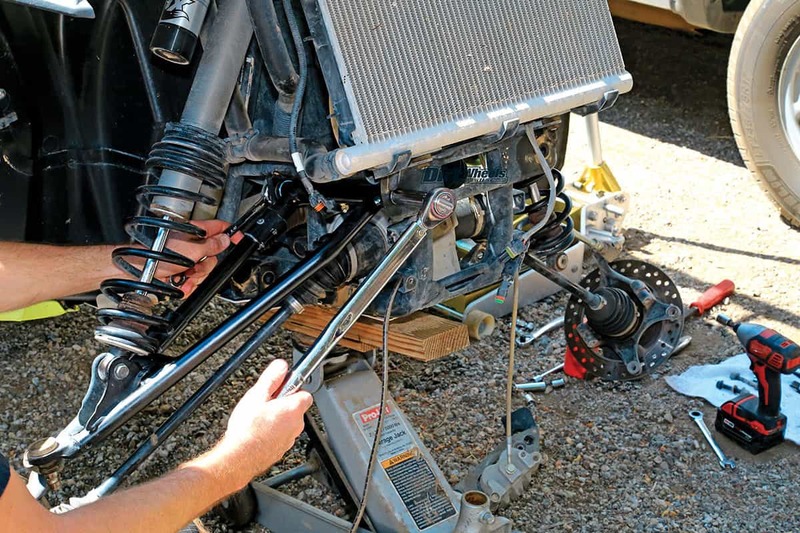 This is maintenance that will pay dividends in suspension performance and the longevity of your machine.